On Monday March 25th, 2013 in block F at Blanchardstown IT, I will be hosting a talk about the direction of youth football in Ireland. The 4/5 main speakers will be talking about what they think is the future of Youth Development in Ireland and how we can learn from abroad. Former Director of Coaching Shamrock Rovers FC. 2001 – 06 freelanced with Chelsea FC as their International Academy Head Coach. Worked with 5 International Teams in that period. He holds an Irish and UK UEFA A License badge. 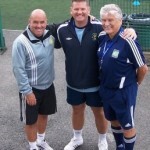 With 20 years coaching experiences at various levels, from Community Grassroots to Elite Development. Mitch has managed and coached in the League of Ireland, at Professional Academies, community clubs and with International Teams. Coached all over World for many national associations and professional clubs delivering coach education programs.He had a Professional club career in England from schoolboy to first team level and he worked with many young players who are now playing in Premier league and Internationally. He is currently the director of Coerver coaching. Retired with injury at 25 and began coaching career. Dermot is a full time Youth Development Specialist and Coach Mentor dedicated to promoting the Horst Wein Optimal Youth Football Development Model, which is player-centred, age-appropriate and games-oriented whilst also emphasizing Game Intelligence – Football that starts in the head and finishes with the feet!